Have you ever thought about hunting wild game for survival? Humans have dealt with this ongoing task for eons. One of the weapons modern man invented to aid in his pursuit of food was the atlatl, or spearthrower. The spearthrower is referred to by many different names in other parts of the world, but in the Americas it is called the ATLATL , which is an Aztec word. This weapon was first developed in Europe nearly 25,000 to 40,000 years ago. Because of its technological advantages over the handheld spear it became widely used throughout the entire world in a relatively short time. The atlatl can increase the velocity of the spear or dart 15 times and multiply the pressure at impact nearly 200 times that of a hand-thrown spear. Because of discoveries of ancient atlatls in modern times through archaeological research and excavation, interest in this weapon has increased dramatically. In recent years primitive weapon enthusiasts have formed societies and associations in the hopes or re-exploring the use of the atlatl. 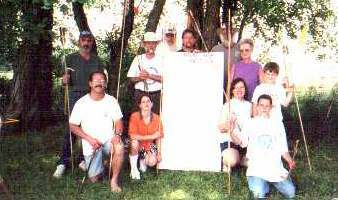 Atlatlists in Michigan, Montana and Wyoming have had organized contests for as long as twenty years. Each state has its own type of competition to determine an accuracy champion. Enthusiasts in the United States have not been on their own in this quest for knowledge. This worldwide interest has culminated in the establishment of the World Atlatl Association, formed in 1995. The world association has nearly 3000 members from the Us, Belgium, France, Canada, Italy, Mexico, Australia and Germany. About five years ago, the World Atlatl Association developed a means to compare the quality of throwers worldwide. The association tracks the scores of the International Standard Accuracy Contest (ISAC) at sanctioned competitions. The contest score is a tally of five throws from a distance of 15 meters and five throws from a distance of 20 meters from the target. The ten throws are added together for a score of up to 100. An "X" ring inside the bullseye is used for breaking ties. A standardized size of target and governing rules are used so everyone in any part of the world can be scored fairly and compared to determine a ranking. Annually a world champion is named, someone who has scored the highest ISAC during that calendar year. A youth's, women's and men's division are contested, with a primitive and open class in each division. Open class allows modern materials, such as fiberglass, aluminum, steel and plastic, as dart and atlatl materials. The primitive class allows only materials which would have been available to people long ago, such as wood, river cane and stone, for the construction of the throwing equipment. An interesting note, eight of the top ten throwers in the world use primitive equipment. The Europeans also have a standardized competition consisting of thirty throws at ten different targets at distances from 8 meters to 26 meters in 2 meter increments. These distances are staggered with the intention of creating a contest more like hunting. There are also competitions for distance, the present world record being 848' 6-5/8" set July 15, 1996 by David Engvall. Pretty remarkable huh? As an attraction for the 1998 Franklin Grove Summer Harvest Festival, Ray and Martin Strieshek traveled from Ohio to demonstrate and help with WAA sanctioned ISAC and European competitions. Because of the success of the event, much enthusiasm was generated among the locals with Doug (Spear Chucker) Miller showing a definite flair for the ancient technology. Since then Illinois has jumped into the mix, and a local group formed its own association two years ago. Its membership started with just a handful of people but has grown to nearly 50 members. During 2000, Doug threw a 94X, good enough for third in ISAC for the year and fourth highest all time. For more information about Atlatl, visit the World Atlatl Associations home page. You can find out about anything you ever wanted to know about the atlatl and and then some. The Illinois Atlat Association has scheduled two competitions in the area for 2001. the first in June and the second in August, both at the Chaplin Creek Historic Site in Franklin Grove, IL. Anyone interested in these events or the art of atlatl throwing can contact Don Asp, IAA, PO Box 20, Franklin Grove, IL via snail mail or call (815) 456-2305.